...secrecy, complex organisational structures, tax havens and profit hungry accountancy firms [are] the key ingredients of the tax avoidance industry. They all come together in the biggest tax avoidance scheme of all, known as "transfer pricing". The name of the game is to shift profits to low tax jurisdictions and avoid taxes in countries where corporations have substantial trading operations. Globalisation has enabled a computer microchip company to design its products in country A, manufacture in B, test in C, hold patents in D and assign marketing rights to a subsidiary in country E. Such a structure gives corporations huge discretion in allocating costs to each country and shift profits through internal trade. Around 60% of the world trade consists of transfers internal to multinational corporations. This gives them numerous opportunities for shifting profits across borders. “Why is it so difficult for governments of advanced economies to prevent profit shifting to tax havens?” Part of the answer lies in the fact that long ago, governments willingly hard-wired into the system certain principles that have now evolved in a way that has made life easy — and profitable — for corporate tax planners. ...Under one-sided methods, these residual profits are, by default, assigned elsewhere. 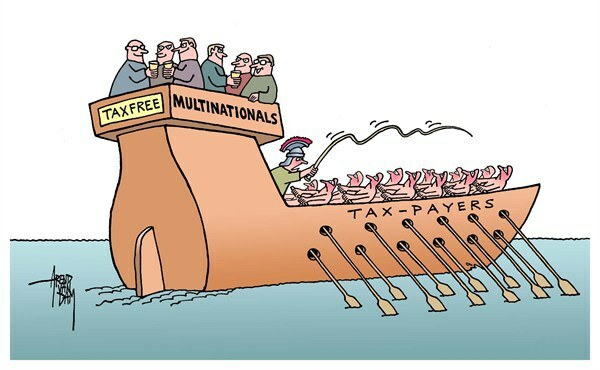 Multinationals have set up structures that ensure that “elsewhere” is a relatively small operation or even a pure holding company in a tax haven. Transfer pricing itself is a perfectly legal accounting method for MNCs [multinational corporations]. Though often necessary for risk management, such as harmonizing supply chains, legal obligations, and management structure, the flow of goods, services, and money across borders between MNC subsidiaries can enable companies to avoid taxes in some jurisdictions by shifting taxable profits (usually to where the tax rate is lower.) Although most transfer pricing does not result in money changing hands—rather, it’s only noted in the MNC’s books—it can have devastating effects on developing countries who cannot afford the due diligence to ensure they aren’t being cheated out of revenue. ...MNCs, especially those with complicated chains of production like extraction companies, can set transfer prices at any link in that chain between which assets—tangible or intangible—shift between subsidiaries. In fact, the most flagrantly abusive transfer pricing is typically that of intangible assets, such as patents or trademarks, which can be licensed from offshore, low-tax jurisdictions. These patents can be held in low-tax jurisdictions as well, and facilitate the flow of extensive royalty payments (which are, by the way, tax deductible) to areas where they will be minimally taxed. A groundbreaking report reveals that Walmart has built a vast, undisclosed network of 78 subsidiaries and branches in 15 overseas tax havens, which may be used to minimize foreign taxes where it has retail operations and to avoid U.S. tax on those foreign earnings. These secretive subsidiaries have never been subject to public scrutiny before. They have remained largely invisible, in part because Walmart fails to list them in its annual 10-K filings with the U.S. Securities and Exchange Commission (SEC). Walmart’s preferred tax haven is Luxembourg, dubbed a “magical fairyland” for corporations looking to shelter profits from taxation. Tax haven this, tax avoidance that; is offshore finance such a big deal? Who Are The Losers Of Tax Havens? For a broad answer, it can be argued everybody does. As outlined above, tax havens have an insatiable appetite for tax revenues, which has a wholly negative impact on public good provision. That everybody in society, in one way or another, depends on these public goods, it means everybody is made worse by these little far-away jurisdictions.